Wanting to become a full-time traveler? In search of a gypsy lifestyle but not sure where to start your search? Then you need to come to your local Airstream dealer in Wisconsin and see one of the many new and used Airstream trailers for sale. Ewald’s Airstream of Wisconsin is known for having a large and diverse inventory of new and used Airstream trailers, with everything from an Airstream Basecamp for sale, to an Airstream Flying Cloud for sale and everything in between. Here at Ewald’s Airstream, we understand that when it comes to travel trailers everyone has different wants and needs and there is an Airstream trailer that will fit those desires and requirements perfectly. Here at Ewald's Airstream of Wisconsin, we have everything from an Airstream Basecamp that will fit a couple entirely, to an Airstream Land Yacht for sale that will give you the luxury of both land and sea. The Airstream Basecamp comes with all the impressive features of a larger Airstream trailer but without the need of a large truck.The Airstream Basecamp has an exterior length of 16’ 3” and an interior width of 6’ 4.5, giving you and your partner room to breath and move about. The Airstream trailer for sale also comes with an all in one bathroom and full kitchen and features a 29-gallon black water tank and a 22-gallon freshwater tank. Do not let the size of this Airstream trailer for sale fool you because, with innovative storage solutions and space savers, your trip will be clean and clutter free. 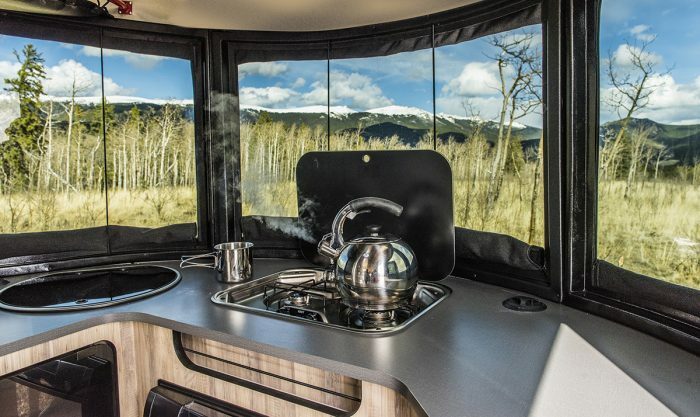 The Airstream Basecamp features covers for both the sink and the stove top giving you plenty of counters and food prepping space a couch/dinette area is easily transformed into your sleeping quarters. 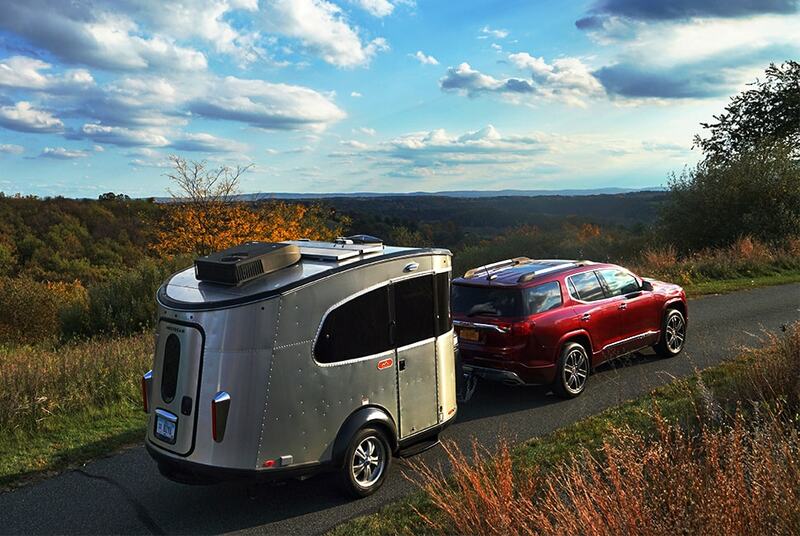 The Airstream Basecamp was designed for those looking to take the path less traveled and features such as a 26” X 46” rear hatch allow you to quickly pack and unpack your travel trailer without having to squeeze through the front door. Plus with optional tents that attach snuggle to your Airstream trailer, you will feel safe and free to let the doors stay wide open and allow the breeze of the cold fresh air to flow through your travel trailer. 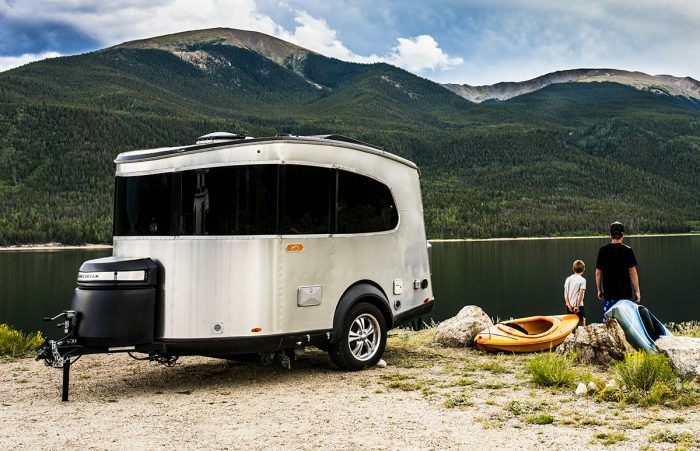 The Airstream Basecamp for sale is a go anywhere do anything kind of trailer, and with an aerodynamic body and advanced anti-sway technology, you will almost forget you are even towing a trailer. Come to your local Airstream dealer new Milwaukee, WI and see the impressive Airstream Basecamp for sale and even walk through this Airstream trailer for sale. If an Airstream Basecamp for sale is not what you are looking for come and see one of the many other new and used cars for sale near Milwaukee, WI at Ewald’s Airstream of Wisconsin.